We’ve all heard the saying “money doesn’t grow on trees,” and I believe we can agree that dietary supplements don’t either. Why is it necessary to supplement our diet with tiny capsules that, if routinely taken, deliver us “so-called” nutrients? Do we not receive these nutrients from the foods we eat? Yes, we obtain adequate nutrients from the foods we eat if we’re eating a diet rich in whole, unprocessed foods that are primarily organic and naturally nutrient-dense. However, we do not get adequate nutrients from a diet that is highly processed or lacking in fresh fruits and vegetables. While getting nutrition from whole foods is ideal, supplementation can be necessary when nutritional deficiencies arise. This can happen due to a lack of whole foods in the diet, poor nutrient absorption, lifestyle factors that deplete nutrients, or even poor soil quality resulting in mineral-poor crops. With an overabundance of supplements in the marketplace, from vitamins, minerals and herbals to amino acids, probiotics and enzymes, how do you know if what you’re buying is potent and active enough to support your health? The New York Times recently published an article that brought to light the truth about low quality supplements. The New York State attorney general’s office tested supplements from four major retailers—Walmart, GNC, Target, and Walgreens—and found that 4 out of 5 supplements tested did not contain the herb advertised on the label. We were pretty shocked at this finding. 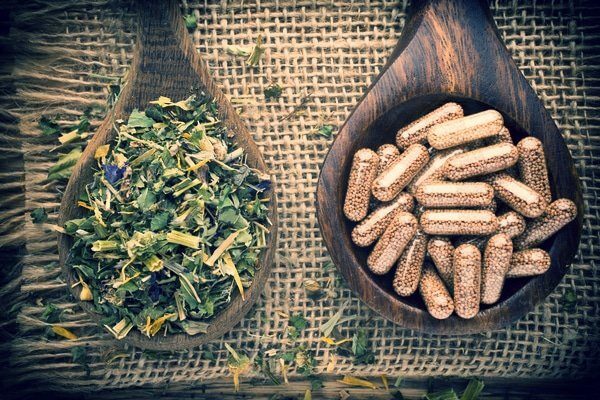 We knew that there were low quality supplements out there with additives or non-absorbable forms of a nutrient, but to think that the herbs simply weren’t in these product at all floored us. Since we know a lot of you are concerned about your health and may use supplements to support it, we thought we'd share some of our knowledge on the matter. So for those who want to avoid deceptive labeling and low quality supplements, I put together a simple guide to help! There are several factors to consider when choosing a dietary supplement. A good multivitamin: For cost efficiency and limiting the consumption of multiple supplements, try finding a basic multivitamin that also includes minerals, bioflavonoids, enzymes, phytonutrients, antioxidants, herbs, essential fatty acids, fiber and greens within one formula. Standardized supplements: Search for supplements that are standardized, a process used to ensure batch to batch consistency. Reputable manufacturers: To name a few: Gaia Herbs, Herb Pharm, and Mega Food are reputable brands typically found at your local-health food store. Medium-priced supplements: These are generally the best value. Expiration Dates: Supplement companies are not required to put an expiry date on the label, leaving you, the consumer, wondering how long it’s been sitting around for. Genuine Philosophy: Seek out honest, high-integrity companies who have a genuine philosophy for people and their health needs. Fillers such as sugar, starches, corn, wheat, dairy, artificial flavoring, sweeteners, and preservatives. Magnesium stearate, a potentially harmful binding agent in vitamins. Synthetic forms of vitamin C & E. The body does not absorb these lab-produced forms the same way it does with natural sources. Look for Vitamin E in the form of mixed d-tocopherols and avoid a synthetic form called dl-alpha-tocopheryl, which is made from petrochemicals. Vitamin C is best absorbed from whole food sources or whole-food blended supplements. Here is our team’s favorite Vitamin C! Synthetic Vitamin D2: When choosing a Vitamin D supplement, avoid the synthetic D2, which may be less effective. Discounted or low cost supplements, as these might lack in potency and may be produced with synthetics and/or fillers to keep the price low. Mass produced supplements manufactured by large conglomerates. When you read “whole food” over “pharmaceutical”, you’re probably already leaning toward the former, naturally. However, there are pros and cons to each grade. Pros: Nature created a synergistic blend within whole foods, containing all vitamins, minerals, enzymes and antioxidants. These nutrients work together to deliver potent nutrition to your body. When you consume whole food supplements, you receive far more benefits, so long as they are quality products. Cons: Whole-food (or food grade) vitamins do not undergo the same regulations for potency and efficacy as pharmaceutical grade. As mentioned in the New York Times article, the FDA targeted name brand supplements that contained dangerous and unlisted ingredients! It’s best to research when choosing a whole food supplement, so hopefully the guide above can help steer you in the right direction. Pros: Many integrative MDs and naturopathic doctors prescribe pharmaceutical grade to patients because their quality can sometimes be superior to whole-food vitamins as they offer precise dosages for treating specific conditions, illnesses and diseases. Cons: Synthetic supplements only offer an isolated (or fractionated) part of the whole. Often times, by taking isolated vitamins, you are getting a “mega dose” of a particular vitamin without the balance of other vitamins, which may cause problems if taken long term. This is why pharmaceutical grade supplements should be used under the guidance of a health practitioner, and are generally taken for a period of time rather than as a daily supplement. I love a good success story, especially one involving an affiliate of Annmarie Skin Care, the beloved Kris Carr! If you have not heard about this amazing woman’s battle with a rare and incurable form of cancer that she has lived with for over a decade, I’d highly recommend getting to know her! Plants are her allies, and well, supplements are too! Of course, with a serious diagnosis of any kind of illness or cancer, it’s 100% advisable to work with an Integrative MD who can carefully “prescribe” pharmaceutical-grade supplements specific for your body’s individual needs. In Kris’s case, she worked with Dr. Kenneth Bock, Integrative MD who helped her regain her health through supplementation (in addition to a plant-based diet). From this remarkable victory, Kris continues to actively inspire readers through her blog. She previously interviewed Dr. Bock about nutritional supplements, who shared a ton of great info. You can watch the interview here! If you're overwhelmed with all the supplement choices in your health food store, here are a few that Dr. Bock recommends for gentle and effective daily supplementation. Omega-3: Beneficial for the heart and brain (& wrinkles, too! ), omega-3 should be taken in a high-quality fish or flaxseed oil form. Quality is key here! My personal recommendation is Green Pasture’s BLUE ICE™ Royal Butter Oil / Fermented Cod Liver Oil Blend. Their unique process of fermentation allows the cod liver oil to maintain its omega-3, vitamin D and vitamin A content, while also allowing the body to absorb these nutrients efficiently. For a vegan-friendly option: David Wolfe's Omega 3+. Vitamin D: This fat-soluble vitamin supports immunity and bone health. It's one of the most common deficiencies in Americans today. I personally have struggled with vitamin D deficiency for years and have taken IU’s as high as 10,000 daily for a few months to get back to an optimal level. A “general” guideline for vitamin D is 1000-2000 IU’s per day, but it’s advisable to get blood-testing to have your levels properly screened by your physician, especially if you are in a lower range. D3 is the most effective and my brand recommendation is Pure Encapsulations Vitamin D3 Liquid Drops (prescribed to me by Dr. JE Williams, our team favorite and also Annmarie and Kevin’s personal doctor). Probiotics: Essential for the digestive and immune system (yes, immune system! About 60% of it resides in your gut), probiotics are incredibly beneficial microorganisms aka ‘good bacteria' that keep your ‘bad bacteria' in check. Dr. Bock recommends Dr. Ohirra’s brand if purchasing over the counter. Look for probiotics in the billion range that include multiple strains (ie: lactobacillus, bifidobacterium). The package and delivery system is also key to finding a quality product, so look for capsules that have an enteric coating or are packaged in double-foil which prevents light, heat and moisture from compromising the delicate bacteria strains. Alternatively, you can eat and drink fermented foods such as yogurt, kefir, kraut and kombucha for extra gut-love, but a little boost from supplementation does wonders for digestive and candida imbalances! What do you look for in a supplement? What are some of your favorite quality brands and how have they benefited your health? Kris Carr: Nutritional Supplements- Which Ones Should I Take? This is very helpful. Thanks so much! What has worked best for me, more than just trying the latest new thing in supplements, is getting clear about my focus and philosophy — and that has helped me climb out of a hole and find true health. Simply put, I look for supplements that do what they say they will, and have either an immediate benefit (or long term effect). For a long time, I followed the conventional advice and the latest fads, but not any more. What I have learned is that all our bodies are different (whether you call them doshas, humors, types or shapes) and so it is most important to pay attention to what works for me. So I always look for the brand and delivery method that truly works best for me — and that I can tell makes a difference in how I feel, look and think. If I am deficient in something, the impact of taking it will (and should) be pretty strong and/or immediate. If I am out of balance, the correction will take longer but the signs of coming back into harmony will be noticeable. And that is important, because it is easy for me to overlook when something comes back into balance, and what was once normal (pain, stiffness) goes away and is replaced with ease and comfort and mobility. I tend to not notice these small daily improvements and thus undervalue the lifestyle and diet changes that brought it about– and be ready to move on as problems clear up. A big difference for me now is my goal– whether I am trying to reduce pain/discomfort/disease OR increase wellness/regain my lost vitality OR maintain feeling the best I have every felt in my life (like a 5 year old full of energy and glowing with life force). Knowing what I am focusing on and working towards has helped me make keep making changes as I moved from reducing pain to increasing wellness to now focusing on maintaining vibrant health — on an energetic level, rather than a mineral/chemical level of deficiency or imbalance. That said, I love Trace Mineral’s Green Paks for a gentle energy lift an hour after I take them (no caffeine, just a healthy mental and physical boost). They help when i have a cold/flu coming on (I can take 2 -3) as well as a general maintenance supplement that I give away to family and friends. In medicinal teas, I like NOW’s Pau D’ Arco and Dragon Herbs’ Longevity Tea. And although I tried Green Pasture’s Fermented fish oils (I tried several fish types) you mentioned, I couldn’t stand the taste, so I stick with my Barlean’s Cod Fish Oil – Lemonade flavor, that is delicious on salads and when mixing up a Budwig Protocol dish of yogurt with added supplements.And I like Dragon Herbs for energy tonics that work at the energy level (Jing, Chi and Shen). I also want what I take to be bio-available, so I have migrated to taking mostly sublinguals, liquids or opening and adding capsules to a smoothie or Budwig Protocol yogurt. And I try out (and read Amazon reviews) to find the exact brand I prefer, because I can now feel a big difference when, like Goldilocks, I find the right one for me. Thank you for mentioning Pure Encapsulations in your great article! We appreciate it! We need to take 100% responsibility for our health and wellness because no one will do this for us. Thanks again! Thanks for this article! Can you share any insights about S. Cerevisiae in supplements? I understand this is a fermented (yeast) and from some cursory research online, it seems some people take issue with it as a vitamin source (being that it goes through an “industrial” process in order to use it as a nutritional source). Not sure if this is a real concern? Per your recommendation, Mega Food has has a women’s one daily multivitamin that I’d love to get. However, it lists S. Cerevisiae next to most of the vitamins in its nutritional breakdown. Just want to better understand what this means. Thanks! The NIH recently issued this helpful module on interactions between supplements and other medications. I think this information is a crucial complement to information about supplements. I was unaware, for example, that St. John’s Wort decreases the effectiveness of many medications, including the oral contraceptive pill! You can view the module at https://nccih.nih.gov/health/herbs/understanding-interactions. Food should be our medicine but when we cannot get enough nutrients from our food then we need to supplement. I would advise researching a company before purchasing their supplements and read the labels. Unfortunately, some companies are not being honest about what is or is not in their products. Their processing may introduce toxins in the supplement that you wouldn’t want to have in your body. An Integrative MD can help and have a functional test done before taking a supplement or with supplements you’re currently taking. Even though a supplement may be clean, it may not work well with your body chemistry. I love this article and a good one to reference for myself and out to friends who have questions. Thanks for publishing it. Also, love your blog. It is so full of informative things! And, of course, I love, love, LOVE the coconut oil for my skin. Wow, makes such a difference! !